Motorcycle training wheels are an inexpensive way to convert your motorcycle to a trike. These are assemblies that attach to your motorcycle. They go on both sides of your motorcycles rear axle as you can see in the photo below. Many kids had something similar on their first bicycles - called training wheels. The rear motorcycle wheel in this type of configuration still provides the drive power to the wheels. The wheels on the add-on kit just roll along for the ride and give some stability from falling over. The result of adding a training wheel kit is a four wheeled vehicle. The propulsion is provided by the original motorcycle rear wheel. When riding it, the rider still needs to lean to turn the vehicle. In addition, during a turn, the wheel on the outside will usually lift. Once the turn has been completed, the wheel that was lifted drops, and drags that side of the vehicle back. When purchasing an add-on, removable kit for your motorcycle, make sure that the position of the axles of the additional wheels is slightly towards the front of the motorcycle. 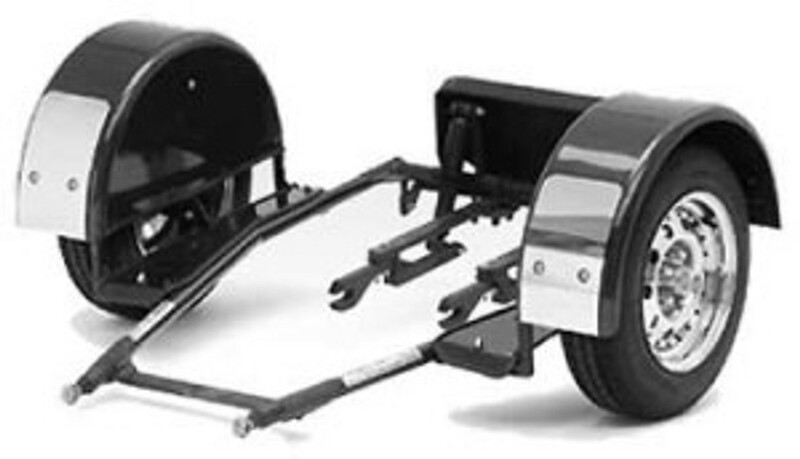 Do not ever consider an add-on kit where the position of the axles of the additional wheels is behind the rear axle line of the original motorcycle. This is a severely unstable configuration and life-threatening, since the wheels will drag excessively.